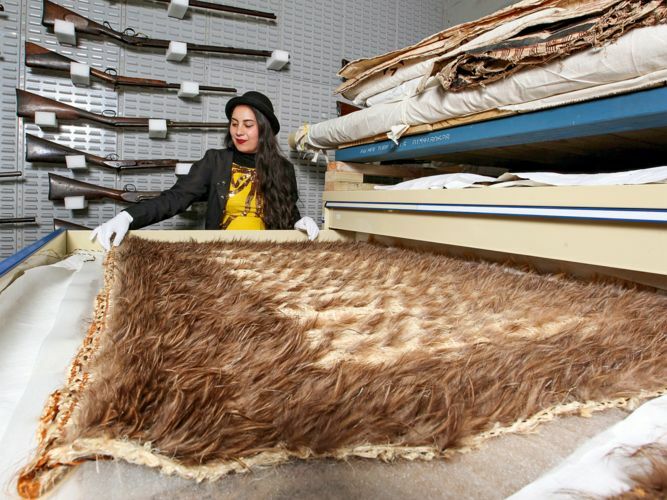 For Kararaina Te Ira, the care and preservation of cultural artefacts is more than just a job. These objects, known in Maori tradition as "taonga", are thought to be prized representations of the ancestors. "They are believed to contain parts of an ancestor's soul," says Te Ira, the 26-year-old curator of Taonga Maori, or the Maori collection, at the Puke Ariki Museum in New Plymouth, New Zealand. "The feeling I get when caring for something that is important to my heritage is the same feeling you would possibly feel when you are expressing the love you have for a grandparent or family member," she says. As curator, Te Ira is responsible for preserving and presenting a range of artefacts - such as woven textiles and wooden carvings - from Maori communities in New Zealand. Te Ira knew from a relatively young age that this would be her vocation. As part of her parents' commitment to enabling their children to understand their Maori identity, Te Ira lived with her grandparents in Waitahanui, a rural community on New Zealand's North Island, where she was immersed in the Maori language and way of life. "In a Maori village you're watched very closely by your elders to discover what your skills and your qualities are. You're nudged toward certain areas," she says. "I guess I used to be the odd child that would really look after my toys. I would make them special little boxes. So I was nudged to look more into museums and caring for things." Te Ira was only seven when she accompanied her parents to a preservation workshop, where two Maori conservators taught her how to box a wooden basket called a kete. She says she remembers the look of pride on the faces of her family members when they worked with objects representing their heritage. "It wasn't just the fact of having them that gave you pride, the pride came from being able to talk about them and being able to care for them in a practical sense," Te Ira says. "I knew then that was a path of importance that I could go down and a way to contribute back to my community." Te Ira was single-minded in her pursuit of her passion and was keen not to waste time. She undertook a Bachelor's degree in Art History at the Victoria University of Wellington and shortly after, a Master's degree in Cultural Material Conservation at The University of Melbourne - all while pursuing internships and jobs in the field. "I wanted to get into conservation quite quickly and not have the time just drag on," she says. Te Ira says the University's course allowed her to explore traditional conservation practices, the care of heritage objects, paper and paintings, while learning about the responsibility that heritage professionals have toward the communities whose cultures they are protecting. "It reafirmed how I was going to practise as a heritage professional," Te Ira says. Te Ira worked in various roles at the New Zealand Ministry of Culture and Heritage, the New Zealand, the NZ Historic Places Trust and eventually, as a project conservator at the Auckland War Memorial Museum. In late 2016, Te Ira stepped into her current role at the Puke Ariki museum, where she is working to expand the depth and range of the collection. She also works with communities around the country, helping them to find ways to better preserve their artefacts. "The Maori way of thinking is you never go forward in the future without reflecting back," she says. "Without these physical markers of our identity, what will stop them from being lost in our memory?" Learn more about the Master of Cultural Materials Conservation program.